Latitudinal, Longitudinal, Altitudinal Tales from today, preserved for tomorrow. Usually the best season to raft/kayak is in the spring when the snowmelt is bringing fresh water down to the rivers. The Gauley River is a special exception. Each year before winter the Army Corps of Engineers drain Summersville Lake into the Gauley, bringing consistently high water levels and thousands of whitewater enthusiasts to the area. Over the period of 30 years, it went from being considered an “impossible” stretch of whitewater to one of the most popular day trips in the country. There were several ECPers in the campsite next to us, so we joined them on Sunday for a day of climbing. 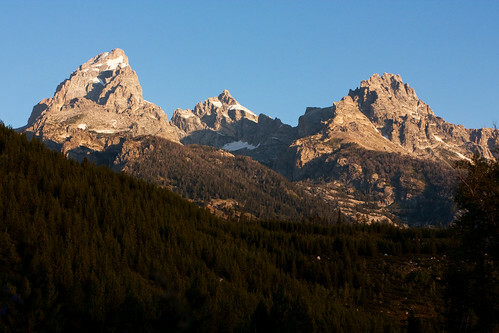 The Grand Teton, Mount Owen, and Teewinot as seen from the Grand Tetons Climbers’ Ranch. When Jeff mentioned a trip to the Tetons, “a classic destination in American mountaineering”, my interest was immediately piqued. I kindly asked Jeff if I could join him and the others to which he was very welcoming. All I had to do was find a climbing partner, and that didn’t take long with the addition of Buttercup to make it a group of 8. The Grand Teton National Park is located in western Wyoming and is often the starting point of many visits to Yellowstone because the closest airport to both is in Jackson, just south of the Tetons. Most visitors do not venture very high into the mountains however, and prefer to stay in the valley with the lakes, amenities, warmer temperatures, and easier access. While there is nothing wrong with this approach (the park is gorgeous to look at and much can be experienced from below, especially wildlife), our trip had one focus: climbing. Sometimes I just like to be around climbing, whether I’m partaking or not. So when I had no plans this past Saturday I tagged along with Jeff, Sam, Rick and Kevin to Darlington Quarry where they would be practicing aid climbing. I hadn’t actually seen aid in action (though I’ll admit that I’ve done some “french free”), so I figured it would be educational at the least. Jeff/Kevin and Sam/Felipe are planning on doing the Direct South Buttress route on Mt. Moran, which goes free at a modest 5.8 except for two pitches of A1 (5.12 free) aiding. This is why we found ourselves at Darlington Quarry on a beautiful Saturday. Darlington Quarry is not a climber friendly area. There is loose, sandy rock all over. It is heavily vegetated. It is not very high. No sign of poison ivy rashes 4 days later but I’ll be very surprised if I escaped urushiol free, since the entire approach was covered with the weed. For these reasons, we figured nobody would mind if we pounded a few pitons. We only managed to find a few worthwhile lines to attempt, and ended up spending all of our time on the one. Sam did the first lead with no issues. Jeff went up on lead afterwards. A few of them attempted the route free on toprope shortly after without much luck, thus proving how much harder you can climb when you pull on gear. With the main hold already having a hairline fracture in it, especially after already seeing a few chunks of rock calve off, I didn’t even bother to give it a go. While we may not have got as much climbing in as we would have liked, it still beat a day in the ‘burbs. Mount Washington is the highest peak in the Northeastern United States at 6,288 ft, famous for dangerously erratic weather. A weather observatory on the summit long held the record for the highest wind gust directly measured at the Earth’s surface, 231 mph, on the afternoon of April 12, 1934. The mountain is located in the Presidential Range of the White Mountains, Coos County, New Hampshire. While nearly the whole mountain is in the White Mountain National Forest, an area of 59 acres surrounding and including the summit is occupied by Mount Washington State Park. Despite being under 7,000 feet high, the mountain must be taken seriously. Even film crews practice here before heading to Mt. Everest to film their latest documentary. EMS offers guided trips up to the summit this time of year, however everyone was in the Mountaineering School to learn how to function under our own power. All content and images on this site are property of their original creator. If you wish to use anything on this page, contact me via truello at gmail.